Warning: Reading this article won't make you look like Phil Heath over night. As announced yesterday, I am about to get back to the study on PGC-1 alpha-4, the protein Carl Lanore and I talked about in the last installment of the SuppVersity Science Round-Up on Thursday. Since I am not going to simply repeat everything I already said during the show here, I suggest you download the podcast and listen to it before you read this article. Thus you would have a basic understanding of what the Ruas' study is all about and can class the additional information this article is going to provide with the stuff you've heard on Super Human Radio. If you don't have the time or are just sitting in the office, where listening to a radio show is not really an option, I would guess that those of you who have been around on the SuppVersity for some time now, should be able to connect the dots on their own. With the combination of in-vitro and in-vivo data from rodents and humans the study Roas et al. published in the latest issue of Cell is a seam of information - literally. Actually, this is part of the reason, why I decided to restrict the following discussion to a summary of those findings that are either of general interest or can serve as a rational foundation for practically relevant conclusions, instead of simply reiterating the whole protocol. PGC-1 alpha and its splice variants - The four known splice variants (alpha 1-4) the scientists tested for are expressed in most of the major organs of our body. Of particular interest for our discussion here are alpha-1 and alpha-4, with the former influencing 2002 and the latter controlling 519 gene function. The overlap between the two (98 genes) is actually pretty small, so that their downstream metabolic effects can be expected to be about as distinct as their underlying triggering mechanisms. While the energy sensing system appears to be responsible for the expression of PGC-1 alpha-1 (learn more about AMPK and how your body controls glucose uptake mitochondrial activity of the cells etc. 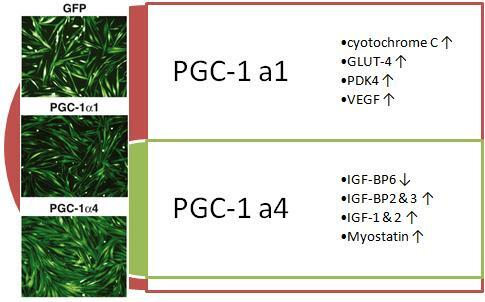 depending on the local availability of energy), PGC-1 alpha 4 expression in skeletal muscle and thus the downstream effects on myostatin (inhibition) and IGF-1 (promotion) appear to be controlled by (contractile, but also metabolic) stress. Whether this is actually the case and in how far certain overlaps do exist will yet still have to be evaluated in future studies. 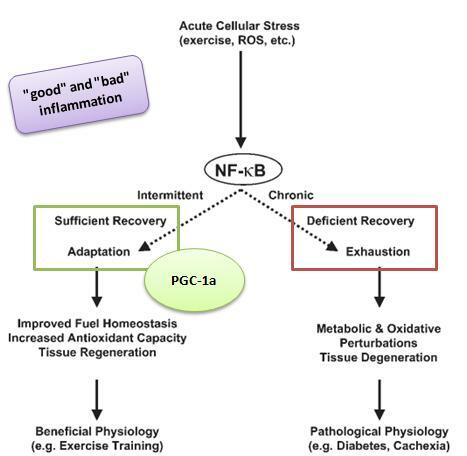 The same goes for the exact involvement of MAPK and other stress-sensors in our bodies and the dose-response relationship between the ROS and exercise induced expression of inflammatory factors such as IL-6 => NF-KappaB and their short term beneficial effects on the training induced adaptation processes (see figure 2). What can be said for sure, though, is that over-training and the downward spiral on the right side of figure 2 is way more likely to be the underlying cause of suboptimal results, than an absence of adequate training stimuli on the left. Adequate recovery (primarily via rest + food and not by popping supplements or suppressing your well-deserved drowsiness with stims) is therefore about as, if not more important than the one additional rep you may or may not be able crank out at the end of an intense workout. What exactly can PGC-1 alpha 4 do? The trends in RNA expression in figure 1 do actually give you an idea of what the ensuing effects should be, but I guess some actual data will make it even more obvious what all these gene essays mean. As the data in figure 3 goes to show, the effects of PGC-1 alpha 4 injections are almost identical to what you would see to a standardized hypertrophy training. And as you may remember from my dissertation on the podcast, the >17x increase in PGC-1 alpha 4 expression in response to reloading of a previously suspended hindlimb in the scientists' rodent model would confirm just that: PGC-1 alpha 4 is expressed in response to muscular overload (as it does obviously occur, when you have not moved your leg an inch for 10 days) and initiates adaptation processes that are meant to strengthen and "build" the muscle to ensure that it is up to future challenges like this. Due to the fact that the effects Roas et al. observed were muscle fiber specific and quasi non-existent in muscles that are predominantly slow twitch fibers (e.g. 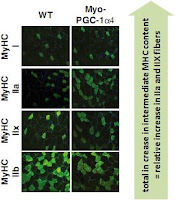 soleus or planatris), the concomittant boost in MHCIIa and MHCIIx myosin heavy chain types you see in figure 4 may easily be misinterpreted as a "transformation" of muscle fibers. If you look closely at the immunohistochemical analysis of the gastrocnemius muscle from wild-type (WT) and Myo-PGC-1 a4 animals in figure 4 the pictures do yet speak a very different language. If anything, the amount of the very fast twitch glycolytic (only) type IIb fibers may have dimished ever so slightly. The amount of slow twitch oxidative muscle fibers, on the other hand, remained constant, while the number of both MHCIIa and MHCIIx positive myofibers increased (the same happens, as you should remember from the Intermittent Thoughts in bodybuilders and recreational trainees, as well). PGC-1 alpha 4 boosting agents include clenbuterol 5x (see Friday's "SuppVersity Science Round-Up Seconds"), forskolin 25x (both in vitro) and cold exposure (4°C) in rodent (!) brown adipose tissue. Aside from the anti-cancer cachexia effect which is not directly related to the topic of this post, the previous paragraphs and the podcast should actually give you the most important information about this recently discovered splice variant of PGC-1 alpha, so that we can now segue into the "real-world" part of the study and take a closer look at the interactions with strength and cardio training I have been talking about on Thursday, as well. You cannot tell me that you have never heard of the notion that doing cardio not after but either before or or in-between your lifts an have its merit. If you can't remember it anyway, go back and reread "Before, After or In-Between? Study Puts Another '?' Behind the Widely Accepted 'Cardio After Weights' Paradigm." Previous research associated PGC-1 alpha increases primarily with endurance training and, albeit to a lesser degree, glycogen depleting high intensity interval training (HIIT), or high volume resistance training. Over the years all of these training forms have been shown to contribute to mitochondrial biogenesis, a repartitioning of fiber types towards a more versatile oxidative myosin heavy chain pattern (similar to what you see in figure 4), the AMPK mediated stimulation of fatty acid oxidation and glucose uptake, angiogenesis and the prevention of muscle atrophy (Arany. 2008). The discovery of this new splice variant of the PGC-1 alpha protein does not diminish the significance of any of these results, but it does make one thing pretty obvious: Building muscle, endurance and oxidative capacity (mytochondria) are not mutually exclusive processes and it is very likely that there is a strong overlap between the metabolic and mechanic triggering processes. Endurance Training (ET): During week 1, participants completed 30 min of stationary cycling at 65% VO2 peak 3 days per week. During week 2, participants completed 45 min of stationary cycling at 65% VO2 peak 3 days per week. During week 3, participants completed 45 min of stationary cycling at 65% VO2 peak 5 days per week. During weeks 4-8, participants completed 60 min of stationary cycling at 65%VO2 peak 5 days per week. Resistance Training (RT): During week 1, participants were familiarized with resistance training program and practiced the movements with light weight during each of the four training sessions. During week 2, participants completed 2 sets of 8-10 repetitions to failure 4 days per week. During week 3, participants completed 3 sets of 8-10 repetitions to failure 4 days per week. During weeks 4-8, participants completed 4 sets of 8-10 repetitions to failure 4 days per week. Table S1 presents the full exercise program. Combined Training (CT): The progression of the ET was the same as that described for the ET group, except that the durations were half as long as the ET group (i.e., 30min versus 60min). The progression of the RT was the same as that described for the RT group, except that the number of lifts was less the RT group. 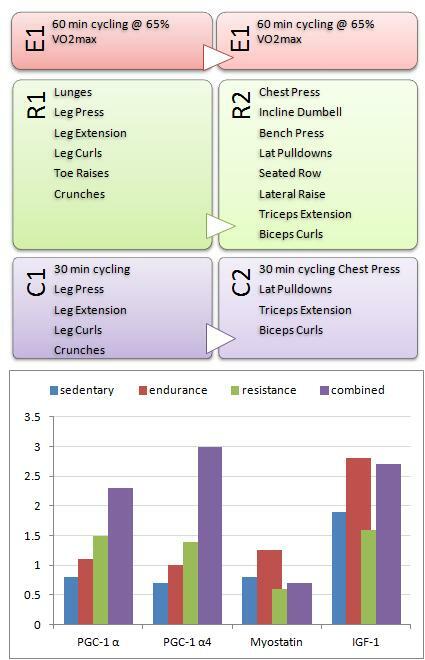 ... as well as the exact protocol they have been following (figure 5, top), you would probably not have expected that the combined training protocol would have an edge over the higher volume resistance training in terms of both PGF-1 alpha 4 expression, as well as the decreases in myostatingthe increases in IGF-1, and the effective mean strength gains on the leg press (+30% for both with a minimal, statistically non-significant edge for the combined regimen; not shown in figure 5). In the absence of detailed information about the increases in muscle CSA and protein content, it may be a bit too early to formulate any implications, but since the question of "doing cardio before a workout" was at the heart of an interesting discussion some of you started in the comment area to Friday's installment of the Seconds, I want to pick up on that and present a couple of garbled thoughts and references that may explain why the combined training did produce greater increases in PGC-1 alpha-4, as well as more pronounced downstream effects on myostatin and IGF-1 than the "growth specific" strength training program. Now, one of the beauties of having your own blog with 1020 individual posts is that you can often simply refer people to previous posts such as the one from which I just copied figure 6 into this article. In fact, the title "8x Increase in "Mitochondria Building" Protein PGC1-Alpha W/ Medium Intensity Exercise in Glycogen Depleted Elite(!) Cyclists" actually gives away most of the 'secret' that's probably behind the purported benefits of a combined training regimen: Glycogen depletion! Now the Psilander study does show that glycogen depletion, which is essentially what will happen (at least to a certain degree) if you perform 30 min of cardio training at a non-exhausting, but still energy consuming pace of 60% of your VO2 max before a workout does work. Without differentiating the various iso-forms of PGC-1 alpha Psilander's 5x increase in PGC-1 does yet not tell us whether we are dealing with the "right form" of PGC here. After all, the Psilander protocol involved two endurance sessions, with the first being a depletion session that was conducted on the day before the actual test and the second being a HIIT-esque exercise test (go back to the original post for more details). Fortunately, there are 2019 other articles on the SuppVersity so that I don't even have to refer you to a study I have not already written about to add another piece to the puzzle. With the more pronounced drop in myostatin in the combined training group in the Lundberg study, the only thing we would still need to further support the practical value of the more recent results from the Roas study would be a concomitant increase in IGF-1, as we would expect it, if working out in a (partly) glycogen depleted state would actually be the reason for the increase in PGC-1 alpha 4 Roas observed in the subjects of his study. Now I could copy and paste another graph, but I guess it will be enough, when I refer you back to the detailed elaborations on the connection between IGF-1 and it's muscle-specific splice variants and exercise induced beneficial, since acute and hormetic inflammation in the "IGF, MGF & Inflammation" part of the Intermittent Thoughts on Building Muscle (click here for an overview). 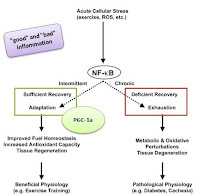 Please keep in mind: Regardless of the fact that previous studies did not test for the PGC-1 alpha subtypes, we cannot ignore the existing evidence that PGC-1 is not mandatory for the beneficial effects of endurance exercise on mitochondrial biogenesis (e.g. Rowe. 2012) and should therefore not overestimate the importance of PGC1 alpha 4 as the "one and only" muscle builder. I have said that before, but I guess it's important to repeat it - this is another missing link it's just like mTOR, testosterone and whatever other magic bullets people will tell you about not exclusively responsible for increases in muscle mass, mitochondrial capacity and whatever else you may just be dreaming of. ...we do actually arrive back at where we came from, namely the difference between training and overtraining in figure 2. Bottom line - cardio pre-workout as an intensity technique: On the basis of these considerations you can think of doing cardio before a workout as an intensity technique that will increase the beneficial stress and thus the demand for greater adaptive responses. That the latter will go hand in hand with an increased propensity of overtraining, particularly if you are not willing to (A) supply your body with the nutrients it needs after the workout and (B) to rest for an adequate amount of time before you hit the gym again, is something of which I would appreciate if it wasn't something I had to repeat in each and every SuppVersity article, but since this is and will probably remain the #1 reason why people don't make progress physique- or performance-wise, it's still the most important take home message at least for those of you who are new to the site. I hope this did not ruin this allegedly pretty lengthy post for you and believe I am not promising too much, when I say that you are soon going to read more about this protein here - after all, it's almost certain that we are going to see follow-up studies in the months to come. Arany, Z. PGC-1 coactivators and skeletal muscle adaptations in health and disease. Curr. Opin. Genet Dev; 2008: 426–434. Febbraio MA, Steensberg A, Walsh R, Koukoulas I, van Hall G, Saltin B, Pedersen BK. Reduced glycogen availability is associated with an elevation in HSP72 in contracting human skeletal muscle. J Physiol. 2002 Feb 1;538(Pt 3):911-7. Febbraio MA, Steensberg A, Fischer CP, Keller C, Hiscock N, Pedersen BK. IL-6 activates HSP72 gene expression in human skeletal muscle. Biochem Biophys Res Commun. 2002 Sep 6;296(5):1264-6. Febbraio MA, Hiscock N, Sacchetti M, Fischer CP, Pedersen BK. Interleukin-6 is a novel factor mediating glucose homeostasis during skeletal muscle contraction. Diabetes. 2004 Jul;53(7):1643-8. Fisman EZ, Tenenbaum A. The ubiquitous interleukin-6: a time for reappraisal. Cardiovasc Diabetol. 2010 Oct 11;9:62. Helge JW, Stallknecht B, Pedersen BK, Galbo H, Kiens B, Richter EA. 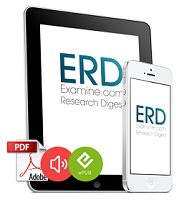 The effect of graded exercise on IL-6 release and glucose uptake in human skeletal muscle. J Physiol. 2003 Jan 1;546(Pt 1):299-305. Kramer HF, Goodyear LJ. Exercise, MAPK, and NF-kappaB signaling in skeletal muscle. J Appl Physiol. 2007 Jul;103(1):388-95. McKay BR, De Lisio M, Johnston AP, O'Reilly CE, Phillips SM, Tarnopolsky MA, Parise G. Association of interleukin-6 signalling with the muscle stem cell response following muscle-lengthening contractions in humans. PLoS One. 2009 Jun 24;4(6):e6027. Rowe GC, El-Khoury R, Patten IS, Rustin P, Arany Z. PGC-1α is dispensable for exercise-induced mitochondrial biogenesis in skeletal muscle. PLoS One. 2012;7(7):e41817. Epub 2012 Jul 24. Ruas et al. APGC-1aI soform Induced by Resistance Training Regulates Skeletal Muscle Hypertrophy. Cell, December 7, 2012; 151:1319–1331. Steensberg A, Fischer CP, Sacchetti M, Keller C, Osada T, Schjerling P, van Hall G, Febbraio MA, Pedersen BK. Acute interleukin-6 administration does not impair muscle glucose uptake or whole-body glucose disposal in healthy humans. J Physiol. 2003 Apr 15;548(Pt 2):631-8. Epub 2003 Mar 14.